While choosing flooring for kid’s room, you must know the flooring materials that are anti-slip and having more friction. Kids room flooring should be comfortable, easy to clean and allergy proof that will offer safety to your dear kid. You can blend two floors in one room to give your kids a warm surface. Try rubber or bamboo flooring with area rugs so that your kids will get a soft and safe floor surface for doing their different playing activities or other activities. 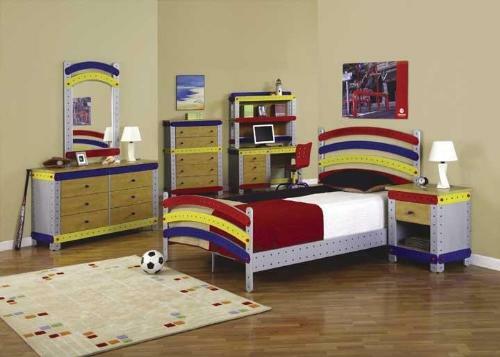 You have to choose the right flooring for the kid’s room so that it can not harm your little and sweet kid. Choose from various types of flooring options available in the market so that it efficiently make the kids room attractive and safer for your kids. If you don’t choose the right flooring for your kids, then your kids may get slipped when the floor is wet or damp. Carpets and area rugs are the best solutions to save your kid from being hurt. Parents are always worried about the safety of their kids. So they always want to choose a floor that can decrease accidents and allergies. The kid’s floor surface must have wear and tear properties so that it will bear the heavy traffic, spills and other kinds of messes. You can make your kids room flooring friendly by using rubber and foam mats in their rooms. 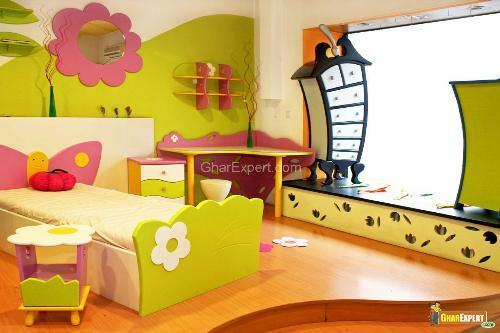 In kids’ room, you can lay rubber flooring as it is safe and durable flooring option. With rubber flooring, your kids would like to enjoy their different activities such as karate, gymnastics, dance etc. Rubber flooring comes in a lot of colors, designs and textures and you can choose the best one for your kid’s room to make it highly appealing. 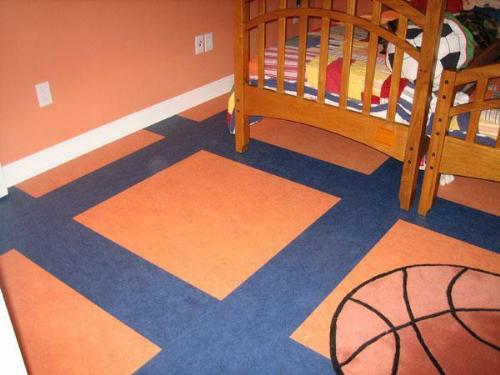 You can install rubber flooring in bedrooms, play areas or family rooms. Rubber flooring is stain and slip resistant. 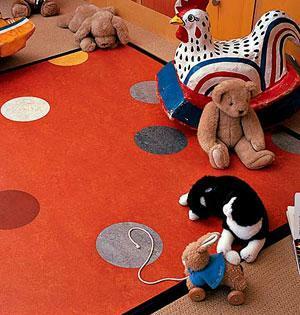 By using rubber flooring, you can make safe your kids from allergy as it has hypoallergenic qualities. Due to antimicrobial properties of rubber flooring, there are no chances of mold and fungi growth. There is no effect of humidity on the rubber flooring. This flooring provides your kid a shock absorbent surface that will give safety to your kid while falling. You can easily wipe the spills that will appear on the rubber floors. You have to clean the rubber flooring regularly like any hard floor surface. If some liquid remains on the rubber flooring for a long time, then it may loose rubber floor adhesives. So you have to clean up excess water otherwise, it may be harmful to your kids. You can make your environment safe and green by using bamboo flooring. If your kid is active and he would like to play freely, then you can choose strand bamboo flooring option that has great wear and tear quality and give your kids the right and safe place for playing. If bamboo flooring may get scratched or stained, then you can refinish it. Choose such bamboo flooring options that are durable and can bear a lot of your kids playing activities and the high traffic. Try to choose the most environmentally friendly flooring so that it will make safe your kids and the environment. Don’t choose such bamboo flooring options that can be scratched easily. If you are installing or using bamboo flooring in the kid’s room, then you have to clean the dust, dirt, debris and spills quickly to make your kids safe from allergies and other diseases. You can also use cork or foam rubber to protect your floor from moisture. If you use area rugs or mats on the bamboo floors, then they will increase the longevity of your floors. But don’t use rugs with rubber backing. With cork flooring, you can save your environment from being polluted. Cork flooring gives your kid comfort and easy to maintain. Choosing cork flooring helps you to reduce the global warming and also minimize the amount of toxins in the kid’s room. Cork flooring is health friendly flooring and makes your kids safe from allergies, microbes and other insects. Cork flooring gives your kids a comfortable and warm surface to walk or play on. This flooring reduces the household noise. This flooring has hypoallergenic qualities that will make your kid allergy free. This flooring gives your kids a floor surface that is resistant to fungi, mold and bacteria growth. You can make the cork flooring moisture resistant if it is properly installed, sealed and finished. Extreme humid conditions can cause expanding or contracting of the Cork flooring. Cork flooring may get scratched. clean the dust, dirt and debris regularly from the floor. Lay a moisture barrier to protect the floor from the moisture. If the scratches may appear on the cork floors, then you can reapply polish or urethane. If your kids would like rolling skates or riding their bikes indoors, then laminate flooring is the right choice for the kid’s room. 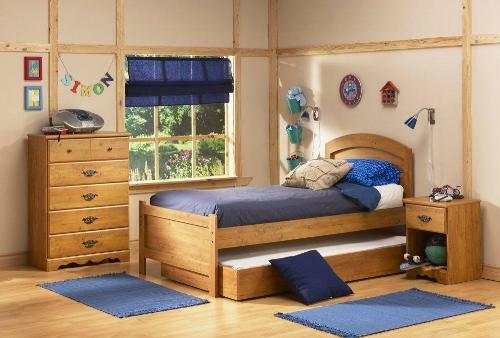 You can afford laminate flooring easily and it looks really superb in your kid’s room. Laminate flooring is available in different colors and designs and it offers you the appearance of wood flooring. You can find the cost of replacing and repairing the laminate flooring is less expensive than wood. If you try, then you can do some of the repairs of laminate flooring yourself. You can apply laminate flooring over any surface including wood and concrete, as well as existing ceramic tile, vinyl tile, or vinyl or other sheet flooring. Laying laminate flooring is a relatively quick and easy project. Choose such laminate flooring options that can’t scratch or dent easily. You can easily wipe the spills. If some parts of your laminate flooring get scratched, then there is no need to replace the entire floor. Some laminate flooring options are easily scratched. Smooth finished laminate flooring may be slippery. During installation and production of laminate flooring, some chemical adhesives and finishes are used that may cause health problem to your kids. You can clean laminate flooring by vacuuming and damp mopping. 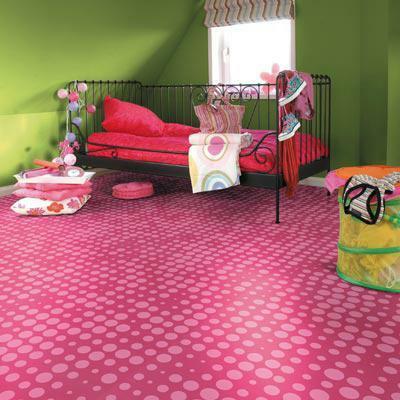 Linoleum flooring is also environment friendly and safe for your kid’s room. It is durable as well as allergy resistant. Linoleum flooring is durable and scratch resistant. You can easily wipe up linoleum floors. Linoleum flooring is the suitable choice for kid’s room as this flooring has hypoallergenic qualities. This flooring is resistant to mold, fungi and bacterial growth. You can not refinish linoleum flooring and when you have got some problem in flooring, then you have to replace it. Sometimes it may get scratched. Avoid smooth finished linoleum flooring otherwise there are chances of falling of your kid on the floor surface. An option that is even easier on the budget is vinyl flooring and if you wish then you can also install it by yourself. Vinyl flooring is flexible flooring and you can clean it very easily. 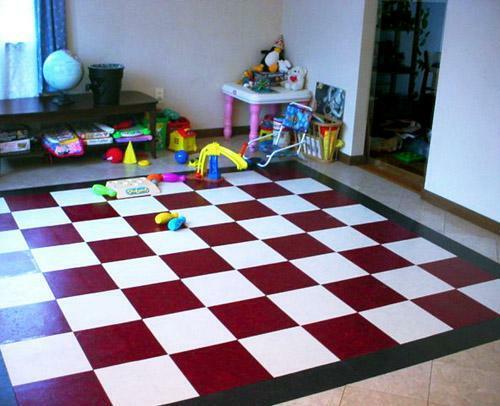 Vinyl flooring is durable and gives your kids the safe playing surface. You can select vinyl flooring from a wide range of colors and pattern that will definitely create a wonderful atmosphere in your kid’s room. By choosing vinyl flooring, you can save your money. Vinyl flooring is available in sheets and tiles and it is available in dazzling array of colors and patterns. Cushioned sheet vinyl is the most resilient among this type of flooring. It is comfortable and quiet underfoot. In addition, it is stain resistant, and the no-wax and never-wax finishes offer attractive looks that are easy to maintain. Vinyl flooring is durable and scratch resistant. It is easy to wipe up the spills on the vinyl floors. You can replace the dented and spoiled tiles with the new ones. Vinyl flooring offers you the moisture, mold and bacteria resistant surface so that you can make your kid safe from allergy and other respiratory diseases. If you choose smooth finished vinyl flooring, then it is not safe for your kids as there are chances of their slipping. Vinyl flooring contains PVC (Poly Vinyl Chloride) that may be injurious to your kids. To keep vinyl flooring looking good, all you need to do is sweep it and regularly damp mop it with a light cleanser that is suitable for the material. Carpets give a feeling of softness to your kids while they walk barefoot on floor. They are frequently used in bedrooms. Wall-to-wall carpeting provides a soft, warm surface for the kids to play on and it offers a rich, textured look that can beautifully complement the décor of any room. They reduce the falling of stumbling babies and also give a safe floor for playing of your kids. But the problem is that carpets and rugs get stained easily and hold up dust and dust mites that can increase the chances of allergy problems. Carpeting is available in a vast array of material, style, color, pattern, and texture. Wool carpeting is the most expensive, but it has the advantage of being naturally fire-resistant and long lasting. With carpets, you can give your kids safe floors that will soft to walk and play on. By using carpets, you can make the kids room surface slip resistant. Choose high quality and stain resistant carpets that can clean easily. Carpets can catch the dust, dirt, debris easily and it is difficult to clean the carpets. They may soak up the droppings and look ugly and harmful to your kid’s health. They may get stained easily. If your kid has allergy, then don’t choose carpets as it may cause a serious health problem to your kid. For the safety of your kid, you have to clean the dirt, dust, debris and spills from the carpets quickly. You have to choose a carpet that is eco-friendly and safe for your kids. Clean the carpets periodically with a steam or shampoo machine to make them clean and dust free.